Rituals can be very quick and simple or elaborate and ceremonial, magical ritual however does stand apart from other rituals. Magical rites are unique and before performing them it is necessary to have an intention, this is a clear idea, vision, image of what is to be attained from the magical rite about to be undertaken. When magic is practiced we are embarking on a journey into the unknown, as we travel through different dimensions. The more people embarking on this journey, the more information there will be to share leading to spiritual evolution, as human consciousness journeys into new realms that offer insight and wisdom. When practicing magic rituals there is a connection with a different type of consciousness that is beyond mortal, from this inter-dimensional contact comes the opportunity for enlightened thoughts and actions. Although as the levels of communication are so different with the different spheres of consciousness, often the information received is in a symbolic manner. There is a soul consciousness linking every single human being, no matter how divergent we may be from each other, one energy impacts another, especially so with those who are awakened and dare to delve beyond human consciousness. The mortals who are open and have the ability to commune with different realms, are not only individually affected by divine energies, they have an affect on their family, friends and loved ones. The flow on from this, is that they in turn will affect others with their passive contribution to human evolution. Imagine if one inter-dimensional message in the form of love, acceptance and healing, reverberated around the world, there would be a variation in all consciousness. Therefore as humans work with magical energies in the spirit of love, kindness and across time, man then absorbs the universal flow which affects all existence. Just one interconnected bolt of supernatural energy at a particular point in time, can trigger a sequence of events that would otherwise not have occurred. There are powers at work available for us to tune into that in our earthly consciousness would not register. To be an effective magician requires the ability to still the mind enough to be open and receptive, enabling you to channel information in the form of energy. Each individual has the power within, as to whether they have the focus or the ability to tap this power and use it effectively, is another question. Those who are involved in activities such as running a race, competitive swimming, the martial arts or any sporting events, have an energy within that they need to hone, focus and channel with a particular precision to attain the desired result. The practice of magic is much the same, it takes dedication, commitment and an understanding of how to tap the inner power source and hone it. Magic rituals create a link with intelligences more evolved than we are, they vibrate at a much higher frequency than mortals, and they are impossible to contact with our earthly everyday senses, hence the need for rituals. To successfully connect to supernatural entities, regular meditation and magic is combined, intensifying the connection. Before beginning your ritual consider what it is you want to achieve, what end would you like to produce. The qualities you will need are imagination, patience, dedication, curiosity, the will to learn and the want to commit. Magic and meditation can only enrich and enhance your life, as you become open to a myriad of possibilities. In some ways when you are practicing ritual magic you are dealing with a power not unlike electricity, and as with electricity it is meant to be handled with care as its exact nature cannot be defined. Learning what to do with the power you are invoking is as important as the stages of the magic ritual you are performing. The practice of magic in modern times does not require a sacrifice and the spilling of blood to appease the gods, or as an offering to the otherworldly beings who are to be summoned. The principles of ritual, many of which have carried through from ancient times, are as valid now as they were when performed centuries ago. Many of the consciousness exercises, techniques and meditations are still used today. One question to ask yourself is why you want to practice ritual magic? The energies of the occult are powerful and a degree of reverence and caution is needed when working with these powers. Think of yourself as an initiate, or the sorcerer’s apprentice who is learning how to manifest and manage otherworldly energies. Ritual and magic work can be repetitive as you try spell casting and try again, over and over. Dedication is required and a commitment to what it is you are learning. Magic is a natural force available to be used by those who have the key to the door, magic is like alchemy forces come together to create. The are many paths that can be taken in the initiates journey. To become a magician you need imagination, the power of visualization, discipline, trust, faith, belief, intuition and the ability to commit. When you begin your ritual work you will learn with practice, how to exercise control of consciousness and action through inner dimensions, thus becoming the master over the magic you are conjuring. In many ways you are the initiate learning how to handle the power, this is akin to the electrician who learns how to safely handle electricity, and always proceeds with caution and respect for the power being handled. It is also necessary to have an evolved moral code, guiding you towards using the powers you will be working with, for benign purposes only. When learning how to practice magic we are absorbing information that alters our consciousness, depending on how we individually respond to it, this change penetrates the structure of our soul. Ritual depends on discipline, knowledge, order, and success depends on our ability to isolate a stream of consciousness, while expelling all influences that will interrupt the pure flow. To become receptive to divine energy we learn how to achieve a blank mind, while maintaining an alert consciousness. It is necessary to become still and calm, yet remain focused and alert, relaxed and peaceful while being open, willing and ready. From the stillness and the silence comes the all. In the stillness you may want to acknowledge, “I am not my body, my thinking, what I see, hear, taste, smell or touch, I am not affected in any way by my senses. I have the ability to control consciousness from whatever high level it is received.” Learning how to turn off individual consciousness, is the base from which all magic practices work from. For ritual work a circle is created to work within, take a pen shape piece of clear quartz crystal and hold it in the right or the left hand, or you may use a wand in place of a crystal, a wand seems to add to the majesty of the moment. Stand up straight and point the crystal or wand, upwards, this is to acknowledge the divine energies from above, point the crystal or wand downwards to acknowledge all other supernatural beings. The energy is felt from the center of our being, face North and pointing the preferred magical object towards the floor, move in a clockwise direction creating a full circle, ending facing North again. Repeat the process, only this time draw a lateral circle, as though standing within a hoola hoop. Next turn sideways, and depending on which hand the magic tool is in, the left or right shoulder will be facing North. Repeat the original process, beginning North and working clockwise form a vertical circle, with this ritual a circle of the Cosmos is drawn . Before doing anything else a state of absolute mind stillness must be attained and maintained, this allows us to bring our minds to a point of focus leading to complete detachment to the outside world. There is a ritual of will and intention that can be done while you are in your magic circle, while holding your wand, conjure in your consciousness something that is worrying you. A problem that you naturally react to, acknowledge and feel the reaction, then think of the word banish, and see the problem being dismissed and disappearing into nothing. You are using the ability to control your consciousness by will and intention, by intentionally calling on something then intentionally banishing it. Very clearly tell the problem to “be gone,” you are sending it out into the universe to then dissipate, it becomes smaller than the naked eye can see and vanishes. Hold on to this point of nothingness for a moment, through will and intention, you have raised and laid something, you are now immune. A very similar ritual, again while standing in your magic circle, with your wand in one hand, pointed downwards, conjure an image of what you want to change. See it in the darkened sky as if looking at a screen, concentrate on the energy within feel it building and moving upwards to then meet with all manner of supernatural energies. The energies meld into the image in the darkened sky obliterating it, the new imagery of what it is you want to create is manifested and appears on the screen. You feel all opposition to the new image released, there is no resistance to the new manifestation. Point your want upwards, feel the energy of that which you desire meeting with the tip of your wand and being transferred into you, to then manifest in your earthly life. With all ritual magic you are moving from a place of neutrality, to a place of linking with the energy of the infinite, the source of energy. To become an adept at ritual magic means learning how to manage energy. Each night before going to sleep allowing your mind to empty, you do this by releasing the days thoughts and feelings. You are detaching yourself from earthly events and allowing yourself to become open to the all, you are rising above physicality. Begin each day with a clean slate, start with a neutral uncluttered mind each morning when you awaken, thus allowing yourself to be open to possibilities. Learn to rise above reaction to daily events, and remain in the zero space of neutrality which allows an objective view of all things. By practicing energy control you not only become a more powerful magician, but a more powerful human. This is a way of banishing all that is negative and being receptive to manifest all that is good and positive. While standing within your ritual circle you can create another space around your body, this can be done with a small crystal in each hand, or a crystal in the left hand and wand in the right. Face North, stretch both arms above your head and let your wrists touch, keeping your arms straight bring them down to shoulder level, extended either side of you. Still keeping your arms straight move them in front of your body with wrists touching, then move both arms until you are touching your legs at the front. Do one full turn to the right and end up facing front, then one full turn to the left facing front. Imagine a white cocoon beginning at your feet, moving upwards and encasing your entire body, then meeting and sealing over your head. Here is your space of suspended animation, a space where you are not affected by what is going on anywhere, a space of complete neutrality, beyond time and space, you created and you control your circle of timelessness. By creating and inhabiting your cocoon of timelessness and light you open a doorway to the Cosmos and all the magic within, you become the keeper of the keys, to the doorway of magic. Once it is established that energy is omnipresent, it can then be absorbed rather than being sought out, it is a force field in which an individual can become part of the whole. If energy IS then we must learn how to become ONE with it, if we are at ONE with the energy that IS, we then become part of the ALL, the SUPREME energy. Over time ritual preparation becomes faster as there is familiarity with the subtleties of the ebb and flow of energies, creating a cocoon of timelessness, light and neutrality can be done in a moment. The ultimate aim is the control of our Inner and Outer worlds, providing a link between Earth and beyond. When creating a magical world in which to work while practicing rites, it is also necessary to know how to readily close the door and exit your created world once work has been completed. A simple ritual to collapse the magical space is to take three deep breaths, exhale deeply count backwards from three to one, when reaching one, clap both hands together three times and say the word “release.” Once this has been done, shake the hands as if shaking off water, sip some water and wash your hands. Once you have the doorway to magic you must then learn how to conduct yourself in other dimensions, and learn how to decipher the information given to you, as often messages come in a symbolic manner. The symbol is a connection for you from one dimension to the other, deciphering the symbol is the key. Much like a new language symbols are your connection between dimensions in effect energy is being exchanged. When connecting with intelligent beings in other dimensions through magic ritual a language is being constructed to allow communication, this is done through symbolism. A skilled practitioner of the tarot may receive the symbol of a tarot card during their communication. A rune reader is likely to receive an inscription pertaining to a particular rune stone. A numerologist will see numbers, and an astrologer will see zodiac signs. Goddesses and Gods often appear and you may spontaneously feel their message, or there may be a slow dawning of understanding. You may also find that certain deities with particular traits present themselves often. If any of these symbols are presented to you and you have no history with any of the divination skills, allow yourself to meld into the symbol, by doing this your imagination and intuition will be activated. Those not involved in divination practices may see a car, a house, water calm, or tumultuous, they may be shown a heart, this pertaining to love, there could be a multitude of other signs that can be related to. Other times a shape, or a sign is seen accompanied with a feeling the visual and the feeling creating a whole, this triggering the imagination and intuition and a message is delivered. Through a mutual connection an understanding is reached between dimensions, and over time various symbols present themselves over and over, from this spontaneous understanding is reached. With regular ritual practice a natural harmony is reached and you have your dimensional Master key. When a symbol is presented that you have never seen before you will not instantly decipher the message, however be still and feel yourself enter into the symbol, become one with it, by absorbing its essence, understanding will be reached. Magical understanding will come to you through merging with the symbols, your understanding and ability will evolve over time. Over time you will find that through ritual practice words will not be necessary, understanding will come through symbolism and the feeling that goes with it, you will absorb the message the way you breathe in air. You don’t question what constitutes air, or what happens as you breathe the air in and how it affects your body, you just accept that it is the giver of life and you understand. It is the same with ritual magic and symbolism, you begin to breathe in the understanding and it reaches your consciousness. A symbol that often appears during ritual work is the ankh, the symbol for everlasting life, this can have a variety of meanings depending on when and how it is presented. Look at the symbol of the ankh meaning everlasting life, imagine you were doing a love spell regarding the future success of a relationship and the symbol of everlasting life appeared, the meaning would be everlasting love, longevity, bonding, partnership, affirmation of love, durable partnership, depth. If the ankh appeared in answer to a spell associated with a business partnership, it would mean durability, strong ties, complementary objectives, ideas in sync, long term success. If the ankh appears like a figure eight, eight in numerology is associated with money, managing money, The figure eight often appears when there are obstacles to be overcome, it can mean success after effort, it can mean difficulties that will require action, determination and dedication. More than one ankh linked together can mean continuity, building, fitting together, working together, extending, growing. If as a symbol appears to you, you allow yourself to enter into it, let yourself become one with the energies and feel the message. In this way through ritual magic, one symbol can be presented and through merging with it, and feeling, a plethora of messages can be absorbed. If you need to charge your energy you can visualize the ankh in front of you exuding energy and you absorbing the energy, this is a very effective meditative exercise. From this visualize yourself filled with the energy of the ankh, then you are able to exude the energy to create harmony around you. Send the energy out to friends, family and loved ones, if someone is sick send healing energy to them. Once you begin to feel and understand the transference of energy, you will understand the depth and breadth of energy merging and sending. Once your ritual has ended and the circle has been closed, document everything that you felt, saw, heard and did. Draw any symbols that were presented to you and write what message was transferred from the symbols. During future rituals do the same and also note if any of the symbols are repeated. Ritual magic should always be practiced at night, if you choose you can use the lunar cycles, for powerful rituals there is more energy during a full Moon, for less intense rituals the waning Moon is suitable. For ritual work candles can be inscribed with particular zodiac signs, depending on the intention of the spell you will be conjuring. Air, the element of Air keeps us alive, Air is Prana, energy, when breathing and connecting with other dimensions we are breathing other atmospheres. Incense is lit to symbolize the element of Air, it creates an atmosphere that will match the frequency of the ritual you are practicing. With the element of Air you will invoke the archangel Raphael, he is the healer of all things a broken heart, physical ailments, emotional ailments, throughout time this is his role. Raphael instructs humanity, the sword he carries is the symbol associated with the element of Air, it is also the instrument to cut away disease, and negativity. The sword cuts through issues and brings matters to a head, the sword also prunes that which is no longer necessary. With the point of the sword, the energy of Raphael, and the movement of Air thoughts can be sent out to the universe, reaching into all dimensions. The sword protects, the sword defends, the tongue is a sword and can bring kindness or pain. Fire, is a powerful element and when invoked, the archangel Michael should also be summoned, for his personification of reason and right overcoming wrong and narrowness. Fire overcomes, heals, cleanses, rejuvenates, by calling on Michael, the power of Fire is directed inwardly and outwardly. Michael is a healer and brings balance, he transforms fire into a safe and manageable form. This ritual begins once the match lights the candle and Michael is invoked to contain and channel the element of fire. The element of Fire can be invoked to help a ritual associated with letting go on some level or another, or to remove the old to make way for the new. It can also be invoked for a new relationship that wants to build on a clear foundation, the energy of fire fans the light of love. If you regularly think of Fire and Michael for a few moments each day, you will have no difficulty invoking the powerful element of Fire for your ritual. Whenever candles are lit before a Fire ritual, or before any ritual, do so with a sense of ceremony, attention and formality. Use a tapered candle or match, to light all candles, and with a sense of the inner spark being ignited to meet with the energy of other dimensions. Fire can warm us when we are cold or it can burn us if we get too close, and do not respect its power. It can light the way and offer clarity, the understanding and managing of its power is all important. Water, the element of Water pertains to the ebb and flow of emotions and relationships, before birth we are immersed in water, our bodies contain water. Plants need water to grow, crops and flowers need water, it is absorbed into the earth and gives life to all that grows. Water links conscious and unconscious energies with the all, integrating all life forms. 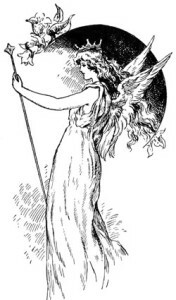 If a water ritual is being performed the archangel Gabriel is called upon, Gabriel is the carrier of messages between different levels of intelligence. He is the symbol of fertility such as fertility of the mind, fertility of a business or fertility of the body to bring new life into being. Before beginning a ritual with the element of Water, take a cup fill it with water and place it near where you will be working, as you fill the cup you charge it with the energy and the intention of the magic spell you will be practicing. You are willing the energy of what it is you wish to achieve as you charge the cup. The cup has a consciousness and understands what is required, whatever the concept it is held within the cup. A powerful ritual is the transference of someone’s energy into a cup of water, as the cup is filled with water the person connected to the ritual is imagined in the cup. Their energy is moving within the water, you then drink the water with love and light while thinking of the spell you are about to perform, by doing this you become as one with their energy and they are part of the spell. This is often the ritual of lovers, it can also be done in the form of healing, the person becomes a part of the loving healing energy exuded and becomes one with the Cosmos. The cup can be used in reverse by filling it with water and whatever it is you want to remove from your life. Whether this be financial difficulties, letting go of a relationship, behaviour, negativity, focus as you fill the cup on whatever it is you want gone. You then tip the water out letting go of whatever it is you want removed, let water from the tap run on your hands as all negativity is washed away. Water rituals can help with emotions, worry, anxiety, love, bonding, partnership, healing. Earth, contact is kept with Earth as links with other dimensions are attained, contact is kept with Earth as we work with inner and outer forces. Ariel is the archangel of Earth and presides over the luminaries, he connects us with creation and teaches us how to absorb Earth’s energies. Auriel is knowledge and experience and urges us to quest, Ariel helps our Earth consciousness connect with the great unknown, he offers us the key. Ariel encourages us to respect the Earth and its natural power of peace and harmony or natural disaster, Auriels monitors and controls Earth’s behaviour and the forces of it. A rock or a gemstone can be the symbol used for the element of Earth. Call on the element of Earth for any ritual where you would like to change one thing into another, such as a long term relationship into marriage. A part time job into a full time career, financial lack into abundance, where you need an alchemical reaction of one thing turning into another more valuable thing, Earth is the energy to work with. If your ritual is to do with wisdom and understanding coming to you concised into a symbol, an Earth ritual while invoking Auriel will provide the necessary energy. Call upon the element of Earth when you want answers in a feeling, via a symbol, you will absorb the message as a whole. Auriel plants seeds of consciousness that grow with vitality and life, providing answers to problems that arise on Earth. The symbol of a shield represents Earth and can be conjured as a means of protection also, the shield can also be a reflective area for that which is desired by the conjuror. The shield also helps abstract ideas take shape, take form and become understanding, the shield can draw understanding, or repel negativity. For a banishing ritual a shield can be used, as it repels negative people and situations, the shield is useful to draw something to you, or to repel or banish something as you deflect harmful thoughts or energies. There is a colour and light ritual technique that can be used, the premise is along the lines of colour therapy. After drawing your circle, and before invoking, chanting, meditating, think of colour and let a colour pop into your mind. Whatever colour you choose, this will be the colour frequency from which you will be working during your ritual. This is like turning on a light in your home by flicking the switch, at the end of your session the light can be switched off. By doing this you are illuminating your inner being, and as you embark on your ritual you will see the chosen colour throughout your rite. This is a very efficient technique if your energy is at a low ebb, or you are feeling down in the dumps, or frazzled, the light will have a healing effect. You will find that there will be a particular feeling, depending on the colour of light you have chosen, or the colour that is revealed to you and you work with. The information you receive will depend on the frequency of the particular colour. Ritual is a connection between differing dimensions, allowing information to travel from one to the other, as intelligences from other dimensions operate through inner dimensions. The ritual begins from the moment the circle is drawn and powerful energies are invoked. We then open ourselves up and become receptive to receive information and impressions, reflected back from other realms to be deciphered by the conscious mind. In some ways we are sending a beam of energy and light, and depending on the depth of connection some response is received from another intelligence. Sometimes impressions can be fleeting, such as catching a glimpse of something out of the corner of the eye, or thinking you heard something but don’t know where the sound came from. There can be a scent that arouses certain feelings, thoughts and memories, in a way, you are receiving thought, feeling, sound sense and imagery as a whole that is to be interpreted. This you do after you have completed your magical ritual and closed the circle. Magic rites begin with energy and attitude, a powerful motivation will allow you to release a power to work with, it is necessary to be totally present. Consecratory rites, energies coming together for a specific purpose, a dedication is made to all who take part in the right, so that human and otherworldly dedicate to the mutual purpose. The rites of consecration include invocations to the deities, or beings you will be invoking, along with a clear definition of what the intention of the ritual is. To prepare for banishing rites the intention must be clear from the beginning of the ritual, so that as you invoke energies they know for what purpose they have been summoned. When participating in a vanishing rite it is necessary to be ready to let go of whatever it is that you want banished, by consciously entering into this rite with this in mind it is easier to banish successfully. Scrying is something all witches learn from a very tender age, it means to perceive or to reveal. To scry you need a reflective surface to gaze into, this can be a crystal ball, a mirror, a candle flame or water. It is an ancient technique used for the purposes of divination. Many witches use a crystal ball or a crystal sphere which stimulates their psychically induced images. You are the scryer and you are going beyond the conscious mind into a mystical place to gain information offered by the cosmos, our ancestor’s scryed using clouds by day, and the reflection of moonlight on water by night. Nonphysical shapes and images appeared on the surface of the water, in mirrors, crystal balls, clouds and flames. Sometimes what appears is symbolic or images from the past or future may be revealed, at times symbols are shown. It is up to the scryer to interpret what the images, or symbols mean and it is only through practice and the intuition of the scryer that accurate, informative and helpful messages and information are revealed. Those who can scry anywhere anytime, are fortunate to have this magical skill, so long as they are able to switch it off at will and do not become completely distracted every time they see a shiny black surface. For the rest of us there are many things we can experiment with to make scrying easier, and different things will work for different people. Scrying can be defined as the art of gazing into a dark mirror, water or crystal, going beyond the physical eyes and letting the inner psychic eye open allowing us to receive visions and information. Scrying is a learned skill, just as riding a bicycle, or ice skating, practice is necessary, even with an innate talent, and as with any other learned skill, patience is needed during the learning curve. When you first begin learning there will be times when you feel you have reached a point and are standing still, then there will be a shift of energy and a growth spurt will occur. There will be sessions where things work well, and sessions where you feel nothing is coming through, but as you continue you will find that there are more highs than lows, and you will feel more comfortable as you progress. Some people have a natural aptitude for scrying. They only have to walk past a shallow puddle in the road, glance at a piece of black glass, admire the glossy fur of a black cat and numerous images flood into their minds. Others have to spend days, weeks, months, even years, mastering this apparently simple technique, staring into elaborate black mirrors and seeing nothing but their own dark reflection – frustrating indeed – and of course, that very frustration makes things more difficult. As with all magic, it needs to be taken seriously, but with a playful and curious state of mind. Trying too hard is counterproductive. One of the things which make scrying so hard for some people to do, is that like meditation, it requires an altered state of consciousness to be achieved, but with the eyes open. In meditation, path working, and in parts of a ritual most people prefer to work with their eyes closed, this makes an altered state so much easier to reach and to maintain. Over the centuries people have been eager to know what the future holds and have tried various mediums to gain the anticipated information that will guide them in their life, they can find out about their financial situation, their loved ones and relatives. When there was no other form of communication, other than the written word carried by a messenger, or the spoken word. And people were away from loved ones, scrying was one way to keep an eye on those close. The world was a much bigger place then and people could not traverse the world with the ease we do nowadays. For centuries scrying has been practiced by adepts and novices alike, by witches, magicians, sorcerers, priestesses, priests, kings and queens, many different tools were used, sacred vessels, pieces of glass, bowls of water, crystal balls, crystals and so on. What is revealed to the scryer is not always easy to distinguish and it can be and the images, symbols or messages can be fuzzy, hazy and unclear. Our Guardian Angels and Spirit Guides often offer us assistance when we are scrying, by way of symbols, messages any imagery. We can consult with the God or Goddess energies and other deities, who can offer guidance through there infinite wisdom. The future always holds many variables and the future revealed when scrying is influenced by our choices, universal shifts beyond our manipulations, and the action or inaction of those with whom we interact. The predictably changeable quality of the future, can through practice become clearer as our skills are honed, and through careful and cautious study and contemplation of the symbols, images and messages received, effective choices can be made. Thus our carefully calculated and implemented actions can holistically influence our destiny. Witches are adept scryers and at a glance are able to discern and interpret what is revealed to them, in whatever form it is presented. The earliest uses of crystals and gemstones comes from the Druids to gain knowledge of their future, the Scottish Highlanders referred to them as the “stones of power.” During the middle ages crystal balls were considered precious items, and skilled scryers often passed them on to their apprentices. Apache medicine men used clear quartz crystals to induce visions and the Yucatan scryers placed a mystical reverence on the clear quartz crystals. The goddess Hathor carried a shield which reflected things in their true light, from this shield she was able to create the first magic mirror used for scrying. The Ancient Persians used the Cup of Jamshid, along with wizards and those involved with occult practices, with this they were able to observe the seven layers of the universe. The cup was filled with the elixir of immortality. The ancient Celts and Greeks used beryl tools, crystal, black glass, water and clear quartz. Romans used any shiny objects and crystals. Nostradamus used a bowl of water for scrying as he gazed into this and saw into the future. The Alchemists John Dee and Edward Kelley, used a crystal ball or polished obsidian. Communication with Divine Energy takes place when someone is scrying, crystals have, are and will continue to be used for communication. Crystals are favoured by diviners because of their symmetry and are important tools for all those who practice the art of scrying. When selecting a stone we should choose one that first draws us and refracts light well, pick it up and see how it feels, close your eyes and get a sense of the energy it is emitting, decide whether it feels right for you. If the first one does not then try the same thing again with another crystal, keep doing this until you find one that you feel in tune with and know you can work with. The traditional way to care for the crystal or crystal ball, was to never expose it to sunlight because sunlight inhibits the connection with the psychic mind and blurs the communication with the Divine Energy. Moonlight, was thought to provide the correct energy by charging the crystals with the energy of the Moon. Scrying is something that becomes easier through practice and it is found that those who are practiced in the art tend to see the same symbols and symbolic images, each time they scry. Therefore once correctly interpreted, the symbols can be quickly and readily understood in the context of the reading. In order to scry successfully it is necessary to allow the intuition free reign and to trust our psychic vision. Scrying can also help us to divine our dreams and use the knowledge to enhance our life. Through scrying we are able to tap the wisdom offered by the Akashic Records which contains the experience and knowledge of all mankind, past present and what is held for our future. Once we enter this realm normal time restrictions do not apply, it means we have reached a place where there are no time limitations. Often witches scry inside a magic circle to avoid being distracted by outside influences which distort the visions, it is better to scry at night as psychic vibrations are more easily received. Night offers the most suitable energy for any form of divination, and those who are skilled in the art of scrying will only do so after the sky is dark and the white noise of the day has lessened. Witches use their scrying abilities to find a lost object, this is done by holding a crystal pendant over a map where the object is thought to be lost, the more energetically the pendant swings the closer you are to the lost item. When the crystal pendant has located the object it will pull down to the specific point on the map. Whatever instrument you use to scry with you will be tapping your Clairvoyant abilities, images will be projected into your crystal ball, crystal sphere or whatever it is you have chosen to work with. It is the psychic eye that projects the images allowing you to see them and be able to interpret the messages. From this vantage point you are able to tune into the past, present and the future, and we are able to see beings from other dimensions. With practice and patience we are able to communicate with these beings from other dimensions, whether they be Angels, Nature Spirits, relatives who have passed over, or Spirit Guides. People often find that they have a particular connection, or spiritual link with people with whom we have been linked and who are acting as teachers. Through scrying and the tapping of the Collective Unconscious we are able to not only see (Clairvoyance), but to hear (Clairaudience) which is hearing with our psychic ear. Through scrying and the burning of fragrant oils, scented candles and incense, we stimulate our psychic sensing (Clairsentience). This where our psychic senses are heightened letting us tune into our feelings using this vital psychic sense. If we think of ourselves as spiritual beings encased in a physical body we can then believe in the Divine Light within everybody and then tap into the wise inner being within us all. There is a vast amount of information floating around the cosmos and scrying assists us in tapping this readily available information. We all carry within us hidden and unprocessed information which through scrying can be accessed and used to enhance our lives. Images seen when we scry, offer us ancient information passed onto us from the experiences of the people from that particular time. Information can be given through images given by Nature Spirits, Angels, Spirit Guides or ancient ancestors, even deceased relatives offer guidance. Eventually after much practice, as soon as you see something in your crystal ball, mirror or water reflection, your mind will quickly interpret words and impressions. You may actually feel something physically, such as tingling in the fingers and toes, or a prickling sensation on top of the head, sometimes it may feel as though your face is being touched, this is to do with the energies you are accessing. Through scrying you are able to travel back in time to view your past in this lifetime, you can then project forward and view what you will be doing in the future, viewing the people you are to meet, and the places you are to go. As you move backwards and forward in time you experience the space where time has no relevance. Although when you move backwards and forward you are in the space of no time, you can if you choose to gauge the time of when the future events are to take place. When symbols are presented to us during scrying, even though we may not understand at first, what the meaning is, there is within us, somewhere down deep inside, where we retain the clairvoyant ability to interpret the meaning. Symbols, and the profound information they contain, will be shown more often once you develop your clairvoyant abilities, this is due to the fact that symbols offer information that is deeper and more spiritual. A crystal ball will reveal detailed images more readily than the flame of a candle, and as your clairaudient ability becomes stronger you will be able to distinguish the messages you are given more readily. Clairaudience and reading for others requires that we speak with gentleness and understanding when reading for others and revealing information that comforts and helps. When scrying with a crystal ball psychic touch operates as a generator to our psychic energies, transmitting psychic impressions, there is an energy field around anything you use to scry with, much as human beings have an auric field. It is important to use our own judgement regarding the validity and the appropriateness of the information you receive. While at the same time being acutely sensitive to the querent’s emotional wellbeing, and whether they are strong enough to receive all, or just some of the information received. Sounds often trigger impressions, fragrances, tastes, images and senses and can transport us to another time and place. Crystals are amplifiers they receive and transmit energy assisting the one who is scrying. To be able to scry successfully, dedication and patience is needed, and if your psychic abilities have not yet surfaced, you may find that scrying can awaken that which is within you waiting to be revealed. Once the symbolism has been revealed to you, and you have acquired sufficient understanding to interpret the symbols scrying will become a more natural form of divination. If you find that it is too difficult to awaken your abilities through scrying, put it aside for a time and try the Viking Runes, or the Tarot, this may be an easier way to begin your journey. You can always go back to scrying as you become more in tune with your abilities. To crystal scry successfully do so at night, as night rules the psychic mind and the energies are conducive to psychic phenomenon. Create a space in your home where you can sit comfortably, and have somewhere to place your crystal, or crystal ball. Always light a candle, or candles before you begin, making sure that candles are placed safely in suitable candle holders, and away from any flammable object or material. Allow yourself to enter a relaxed state by closing your eyes and taking several deep breaths, when you open your eyes touch the crystal, or crystal ball until it feels warm, by doing this you are connecting your energy to the energy of the stone. The heat activates the stone and you are becoming as one with the instrument you will be using, thus allowing the psychic energy to flow. Before beginning to scry, and while touching the stone it is important to contemplate the intention of the reading, being as clear and concise as possible. By sending out a clear message or thought tuning in to the necessary psychic energies will begin. You are now ready to gaze into the crystal, or crystal ball, at this point you are going beyond the conscious mind and entering a place of psychic awakening, where you will be receptive to messages, images or symbols that may be revealed to you. As you gaze into the stone imagine your mind merging with the energy of the stone and being encased by the light within the stone. As you do this you will feel the energy shifting, go beyond any physical images as the reflective light of the stone links you with the Divine Energy, enhancing your psychic vision. When you feel as one with the Divine Energy, absorb the impressions and insights that come to you, your senses will heighten and your inner psychic ear will be acutely aware of sound. Relax into this energy and feel it flow through you. While scrying information can come to you via all five senses, and will not necessarily be visual, sometimes it is just a sense of, or there may be flashes of intuition that you instantly understand the meaning of. How you receive the information is not as important as how you interpret it, when you review what you have perceived during your scrying, do so in a non-logical way. As you are learning, limit your sessions by giving yourself a specific amount of time in which to work, begin with ten minute sessions and work up from there. You are aiming for a session of forty five minutes in length, in this time you enter an altered state of awareness leading to acute psychic receptivity. Water gazing, dark water is a good way to start, not least because it is easily available and costs nothing. A pool can be lovely to scry in, though I would recommend sitting or kneeling down to do so, since it is very easy to forget what your body is doing once your mind becomes absorbed, and it is somewhat undignified to fall into the (possibly stagnant) water at a moment of great revelation. A black bowl filled with water is another method and has the advantage of being safe and suitable for indoor use. Tap water is fine, but spring water will probably work better. Perhaps the best kind of water to use is Moon water: spring, rain or sea water which has been placed in the Moonlight every night for a whole lunar cycle. The water can be blessed in whatever way you feel is appropriate, possibly dedicated to one of the Moon goddesses who rule such activities as these. An alternative to using a black bowl is simply to use any dish but to darken the water with black ink. The old witch in her cottage would doubtless have done her scrying in a bubbling cauldron of stew or in the water boiling in an iron pot ready to make up some herbal brews. Crystal gazing, always use a clear crystal, one you have chosen for the specific purpose of scrying, and only use it for this purpose, this is the most popular form of divination. It is to be a crystal that draws you and one that feels comfortable to the touch, place it on a table in front of you. Do your deep breathing until you are completely relaxed, make sure you have a lit candle behind your crystal then touch the crystal. When scrying with a crystal you may turn it to view different images, crystals are conductors of energy, able to send and receive signals. Once you have become attuned to your crystal you will receive a wealth of information, through thoughts, images, symbols, senses, supernatural beings, or loved ones. Older crystals have a higher frequency and are able to keep records of ancient knowledge. As you gaze at your crystal you are looking at the window of the crystal and while you work the crystal will bring into balance the body, mind and spirit. When you and your crystal link frequencies you will intuitively receive information that is relevant, sometimes when gazing into the crystal shapes will move and change before your eyes. Fire gazing, flame of a candle can produce some dramatic and startling results as the energy of fire is conducive to psychic visions, always use candles with care and place then safely in candle holders. Mirror gazing, black mirrors easiest to use because they don’t slop about like water (at least not under normal circumstances!). They are expensive to buy but very easy to make. Spray the back of the glass from a cheap clip frame with a couple of coats of black enamel paint. Make sure the glass is spotlessly clean before you do so as any little marks may spoil your concentration when you come to use it. Once the paint is completely dry, return the glass to the frame. Bless the mirror if you wish to and treat it with the respect due to any magical object. It can be kept hanging on the wall or put away after use, wrapped in a natural material like silk or cotton. If you prefer something a little more fancy, charity shops are excellent hunting grounds for interesting frames. The size of the mirror is not important, although if you are just learning the technique, a larger surface area will probably prove easier to use. I would also avoid too elaborate a frame on a small mirror as it may distract you. When gazing into a mirror, with all lights turned out you enter a trance preparing you for scrying work, it acts as a focal point for visualization and can become a doorway into the astral plane. The dark mirror allows communication with higher realms, and the subconscious access to the Akashic Records. View your past lives by gazing into the mirror and watching your face change shape, and your hair change style and colour. Each time you try this, the images become more refined and detailed, allowing you to gain a clearer picture of your history. Spirit energy can also be perceived while gazing into the mirror, some people find this a little daunting the first time they try this. A black scrying mirror is a powerful psychic tool, offering the user hidden knowledge and clairvoyant ability, it can other be a portal to other planes of existence. The hidden mysteries of oracular temples and the ancient rites of the magick mirror and the techniques that were practiced are again coming to light. Egyptian Dream Scrying, used by the ancient Egyptian priests and priestesses as part of their initiation ceremony. Water would be placed in a large black bowl, after entering into an altered state the Initiate gazed into the vessel and the Initiates destiny was revealed. To use the Egyptian Dream scrying technique you must observe absolute silence once the sun sets, until after you have finished scrying. Drink only water before you begin and shower or have a bath, after which you are to use olive oil on your temples. After bathing and before you begin scrying light a candle. Next write on a plane white piece of paper with black ink the purpose of your Dream scrying, and the name of a dream god. Morpheus and Thoth are both dream gods. Draw an image of the dream god on your left palm, sit comfortably and gaze at the candle flame. Look at the image on your palm and call upon the dream god of your choosing, by saying the name of the god and then recite after the name “I invoke through the silence of night awakened power of dreams divine.” You then focus on your question and blow out the flame of the candle. After this climb into bed and go to sleep, when you awaken write down your dreams and decipher the message. Symbols are subjective, and interpretation is peculiar to the diviner, a crystal will offer a clear picture of a symbol or symbols, they can be messages from spirit energy nearby. You will likely find that over time, and after symbols are repeated, you begin to get a sense of what they mean and the message becomes clear. Blue clouds: Career or business success. Gold clouds: The chance of a new romance, a flow of cash, prosperity. Grey clouds: Dark gray – Black; Sadness, disappointment, ill fortune. Green clouds: Happiness and good health. Orange clouds: Unresolved emotions, suppressed anger and aggression. Red clouds: Be aware of what is going on around you. Silver clouds: Some difficulty ahead which will be overcome leading to happiness. White clouds: Good fortune awaits. Yellow clouds: Be patient and strong there are obstacles to come. Apophyllite: This stone allows us to see into the future after gazing into it. Diamond: Suitable for all types of scrying. Obsidian: This is a black power stone that aids us in accessing the subconscious mind. Scrying is a magical art with many possibilities. Exactly what it is and how it works is for each individual practitioner to decide for themselves, but it will certainly enhance and focus both the psychic and creative abilities of the magician who is drawn into dark pools to find the bright treasure of secret knowledge. The act of scrying is related to the Moon and lunar energy that is why it is always best to practice after dark. When within your home and before you begin, extinguish electric lights and work by candlelight. Experiment with where and how you like to work, and always place yourself in a calm and quiet environment to assure a successful session, you may also work with quiet music, without lyrics. For any type of divination a calm and meditative atmosphere is necessary, somewhere the scryer can feel unhurried, peaceful and calm, and are able to comfortably open up to the Divine Energy.